Increasing awareness and inspiring others is a big part of what we do. This is why we created ATG Academy to provide training to businesses, aimed at preparing others to deal with environmental challenges. 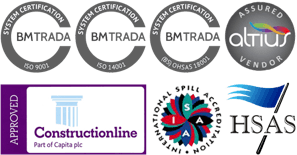 Our training sessions are accredited by the CPD Standards Office™, which mean they have been checked for accuracy and content, and account for qualifying hours required by the RIBA for architects and the RICS for the construction industry. All 4 of our courses are CPD accredited and our Japanese Knotweed, Asbestos in Soils and Remediation courses are free for businesses to undertake, provided at a location of your choice. Each of these three courses takes 60 mins to complete and delegates are provided with a certificate of completion. Our Environmental Awareness Training can take between 2-3 hours to complete and demonstrates how to effectively deal with an oil/chemical spill on your premises. Part of this course is class based but also contains a practical exercise, giving you the opportunity to practice what you’ve learned! If you’d like more information or to book, please call or email us and we’ll get back to you ASAP. Location is at your request and we’ll even cover lunch! We can deliver this seminar at a location of your choice. This 3-hour course focuses on spill response and how to effectively contain a spill while providing valuable insight into the devastating effects pollutants can have on our rivers and land. Even with asbestos being banned many years ago, it’s still found within many existing structures and often within the soil on brownfield sites which have previously had demolitions.